Other species such as musk, white cheesewood, horizontal, She Oak, Native Olive and even figured eucalypt display unique characteristics that are favoured by makers for specific tasks. Not all special timbers are commercially harvested. A supply of dead and down trees also come from salvage operations. Examples of salvaged timbers include King Billy Pine and Huon Pine. Special timbers occur within a range of habitats, including Blackwood swamp forests, mixed forest and rainforest. Blackwood and silver wattle can also occur in dry forest and woodland habitat. None of the six key special timbers are listed under the Tasmanian Threatened Species Protection ACT 1995 or the Federal Environment Protection and Biodiversity Act 1999 and all are well represented both within and outside of the extensive Tasmanian reserve system. 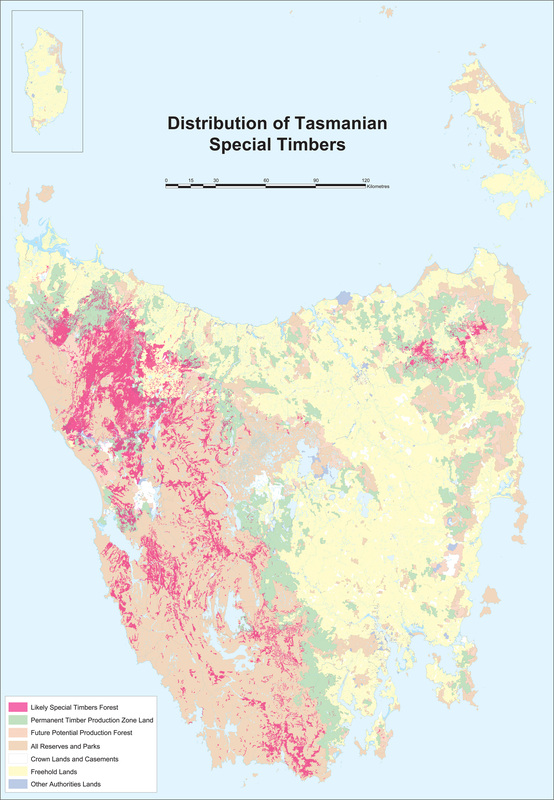 A map showing the distribution of special timbers in Tasmania may be downloaded from the link below.